The 2013 Prince George Christening Gold Proof Five Pounds Piece (£5) was issued by the Royal Mint to commemorate the christening of Prince George of Cambridge. The reverse design features a centre inscription 'TO CELEBRATE THE CHRISTENING OF PRINCE GEORGE OF CAMBRIDGE', with date 2013 below, and the Lily Font with harp playing cherubs to the right and left with decorative lilies (Designed by John Bergdahl). Queen Elizabeth II’s fourth portrait can be seen on the obverse of the coin (Designed by Ian Rank-Broadley). The gold £5 crown is made of 22 carat gold, and weighs 39.94 grams. It has a diameter of 38.61mm. 1,000 2013 Prince George Christening gold proof five pounds pieces were issued by the Royal Mint. Mintage: 1,000 (may include coins issued as part of a set). Minted at The Royal Mint. China Moon Rover Lands on Moon. Nelson Mandela Dies at 95. Margaret Thatcher Dies at 87. Pope Benedict XVI resigned. Not that many people own Gold Five Pound coins, I suppose mainly because they are an expensive coin even in bullion form. Perhaps even fewer realise there are two basic kinds of gold five pound coin. They are very similar, yet distinct. Often referred to as the non commemorative £5 coin or the Quintuple Sovereign as it is exactly five times heaver than a Sovereign (7.9881 x 5 = 39.94g). 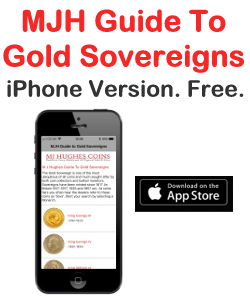 As one sovereign is nominally one pound then a quintuple sovereign must be five pounds. 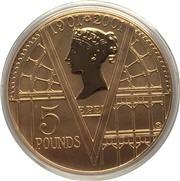 The Gold £5 coin has its history deriving from the five guinea coin right back at the start of the 19th Century. In those days a guinea was valued at one pound rather than the one-pound-and-one-shilling it is often remembered as nowadays. 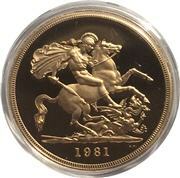 George III, George IV and Victoria all issued actual gold £5 coins and others issued a few too, but Elizabeth II began the surge in production, especially from 1980 onwards. From 1990, the £5 coin was minted in Cupro-Nickel too and silver versions were also available. The Crown is another English coin with a long history. You may remember the Half-Crown from pre-decimalisation days, but the Crown has been a commemorative coin for as long as we can remember. The Crown was legal tender at a quarter-pound, which was five shillings (25 pence in decimalised money). In the Eighties we saw the introduction of the pound coin and the two-pound coin, so the Government decided that the crown needed to be restored to it former glory as biggest denomination coin and the crown was re-denominated to £5 in 1990. This re-denominated was OK by itself, but as a (still) mainly commemorative coin it was soon available not only as Cupro-Nickel but as silver and ... gold. That meant we had a new, official, gold £5 coin. It also weighs 39.94g. And to prove its value it has '5 pounds' written on it. 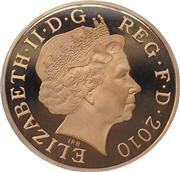 The only difference between the sovereign gold £5 coin and the gold crown is the diameter. The crown maintained its original diameter of 38.61mm compared to the slightly smaller 36.613mm of the sovereign type. The re-denominated had other effects too. Whether re-denominated is determined as from this point onwards or backward-compatible is unclear to many. The original crown was a gold coin, so does that mean that Henry VIII's gold crowns were the first £5 coins? So the history of coins starts to rewrite itself in some ways, although if this is intended or correct I'm not sure. I've noticed many dealers referring to these coins as '£5 pieces'. Maybe it's a way of avoiding the confusion and grouping the coins into the same category rather than having them as two separate entities. Besides the slight difference in diameter (which is difficult to see as most of these coins are encapsulated in some way) there's little to tell. If the reverse looks like it commemorated something then it's probably a crown. If the reverse is the same as the reverse of a sovereign of the same year then it could be a five pound coin. Whatever, you have a gold five pounds with almost 40g of gold; it's impressive and they are a great investment. Five pound coins are aften in 4- or 5-coin sets, together with combinations of a sovereign, half-sovereign, double sovereign, quadruple sovereign and maybe some commemorative item or a year-set collectable. They can be bullion, proof or matt-proof. Despite the high intrinisic value and even higher collector value, five pound pieces are much sought after and are often sold out within days of release causing some of the coins to have a very high price tag. 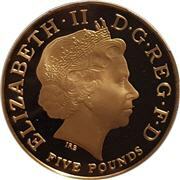 Do you want to buy or sell a 2013 Gold Proof Five Pounds - Prince George Christening? 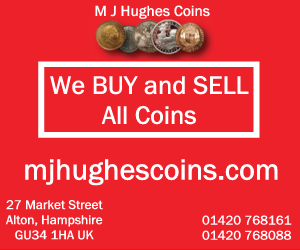 Selling to M J Hughes Coins means that you do not have to pay sellers fees, Paypal fees or any other transaction fees. They will give you an immediate offer and pay you the same day. Single coins or entire collection. Buying from M J Hughes Coins gives you a money-back guarantee of authenticity. 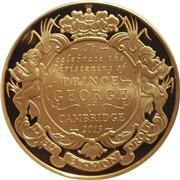 Visit http://mjhughescoins.com/product/2013-prince-george-christening-gold-proof-five-pounds-pcgs-pr70/.